Flyweight Boxing champion Eileen “The Hawaiian Mongoose” Olszewski (9-5-2, 1-KO), 45 years of age, will be back in the ring on Friday, September 5, 2014. Born in Honolulu, Hawaii, Eileen Olszewski came to boxing with a long pursued martial arts pedigree. After a highly successful amateur career, she turned pro in 2006, having “aged-out” of the amateurs. In a division with a lot of quality fighters, she continues to holdher own with the best of them and is currently ranked number two in the United States and in the top ten world side by Box Rec. 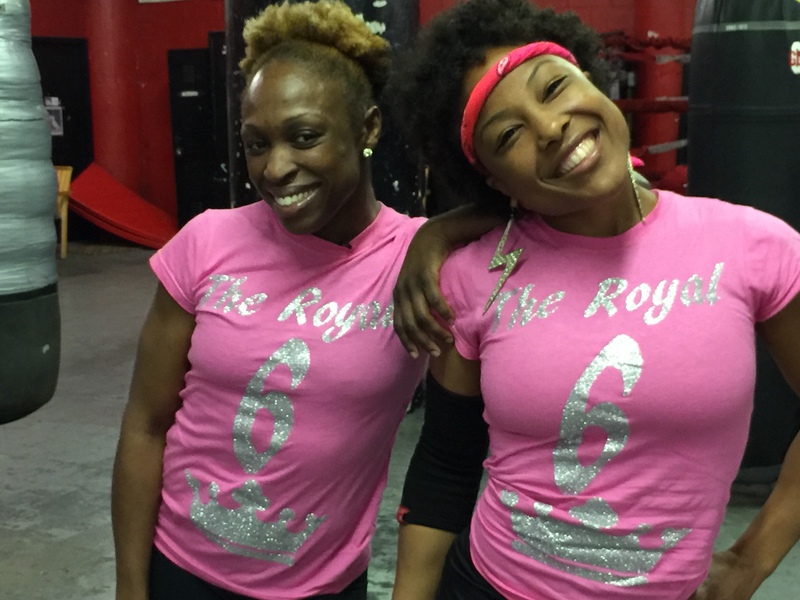 She is also part of a growing group of highly talented female boxers who remain active competitors well into there 40s. 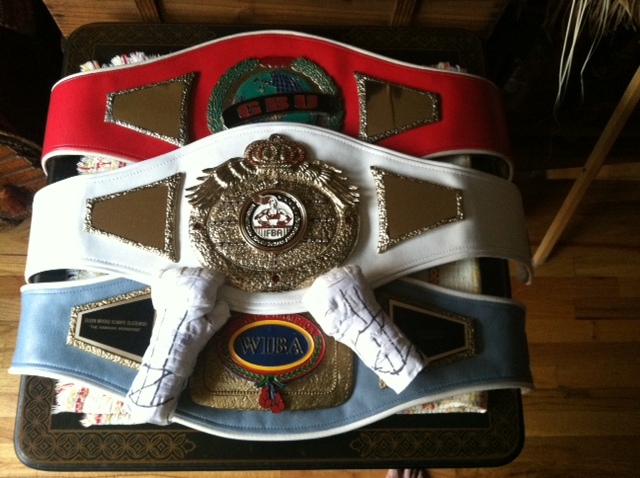 Eileen Olszweski’s boxing belts. In her native Hawaii, she is the most decorated boxer in the state. 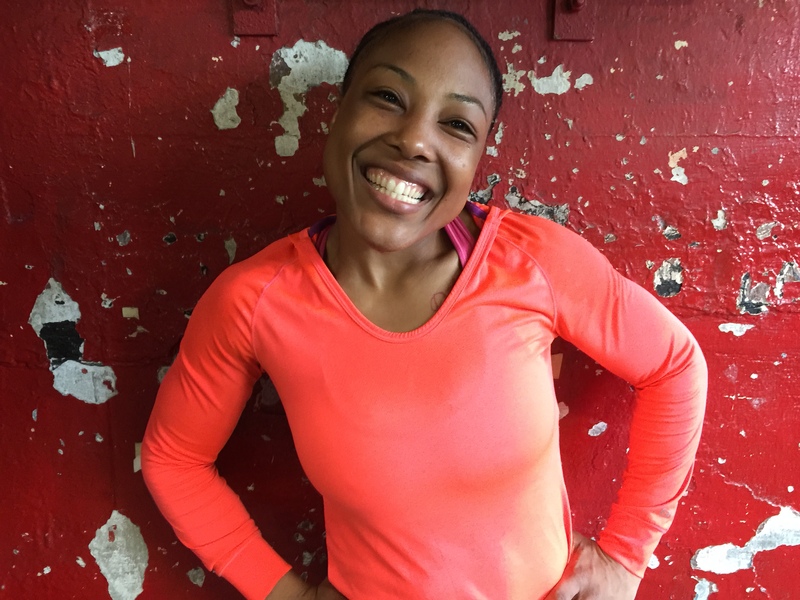 In between her busy schedule preparing for her fight, Eileen took the time email Girlboxing with a series of Q & A responses. A special thanks to her for sharing her thoughts on her upcoming fight, boxing in general and the things that are important to her in the sport. Here’s what she had to say. 1. Coming off your successful win over Jodie Esquibel (6-7-1, 2-KOs) for the Universal Boxing Federation female flyweight title back in January, you will be taking on Christina Fuentes whose (3-6-4) record belies a tough, hard-hitting, scrappy fighter who has consistently pushed herself against tough opponents on September 5th at the Brooklyn Masonic Temple. Tell us about the fight and what your game plan is as your ready for the bout? There are many tough and formidable boxers whose records don’t belie their talent. The numbers can never convey the dynamics and circumstances of each fight. You need to look at whom and where they have fought primarily. For Fuentes, I look at her as I do with every opponent I step in the ring with. I underestimate no one. 2. Given that Christina is 22 years old and you will be turning 46 in September, how are you going about preparing for the swarming energy of a fighter half your age who has given such fighters a Heather Hardy a very hard-fought contest that some would arguably say she fought at least to a draw, if not an out-and-out win. This is nothing new to me. Since I began in the amateurs the girls were always pretty close to half my age with more experience. It’s always bugged me when a reporter who hadn’t done their research labeled me “the veteran” because they just looked at the ages and assumed I was the more experienced fighter. I am fortunate to have a great coach in Matthew my husband that knows how to train me physically and mentally despite my age. 3. You are listed in the #2 spot on the Box Rec list of top ten female fighters in the Flyweight division in the US and #10 in the World. Assuming a win against Christina Fuentes, what is next for you? I never look past the fight I have in front of me at the moment. I focus on each fight as they come. 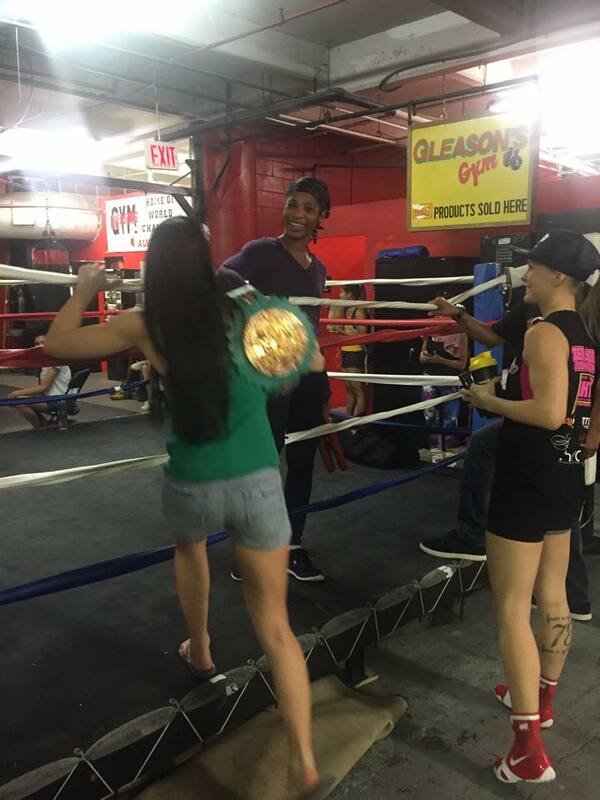 I let my coach and manager handle the fights for me. 4. Before you turned pro you had a successful three-year career in the amateurs. How did you get started in boxing? What made you decide to turn professional? I began competing in boxing after training with Matthew in his fighting style, which combines western boxing, kickboxing, traditional Karate, Judo and Jiu Jitsu. He described it as a hybrid, which combines all the fighting arts necessary to be a complete fighter. This was before the name “MMA” was even coined. After a year, he registered me with USA Boxing to give my training an application, as it was the most organized branch of combat with regular competitions. I just love boxing so after I exceeded the age limit for amateur boxing I wanted to continue. It took three years to get my first fight and that’s where David Selwyn my manager saw me and the three of us have been together ever since. Eileen Olszweski landing a left hook against Anastasia Toktaulova in Miami, Florida, in their 8-round GBU and WIBA Flyweight Title Flight on 12/17/2010. Photo courtesy of Eileen Olszweski. 5. Having watched you fight when you won the UBF title, it amazes me to think that you are turning 46. On the subject of age, with a respectable pro record of 9-5-1 that stretches back to 2006 and an amateur career that began in 2000, what is it that motivates you to continue boxing? Are they still the same things that brought you into the ring in the first place? If not, what has changed? What motivates me is that I honestly feel I’m still improving and getting better despite my age. If I could look back at myself at any point of my boxing career and say “I was better back then”, then I guess it’s time to step back and enjoy another chapter in my life. 6. You boxed for many years before female boxing entered the world stage as an Olympic sport, what effect do you think that is having on the sport? 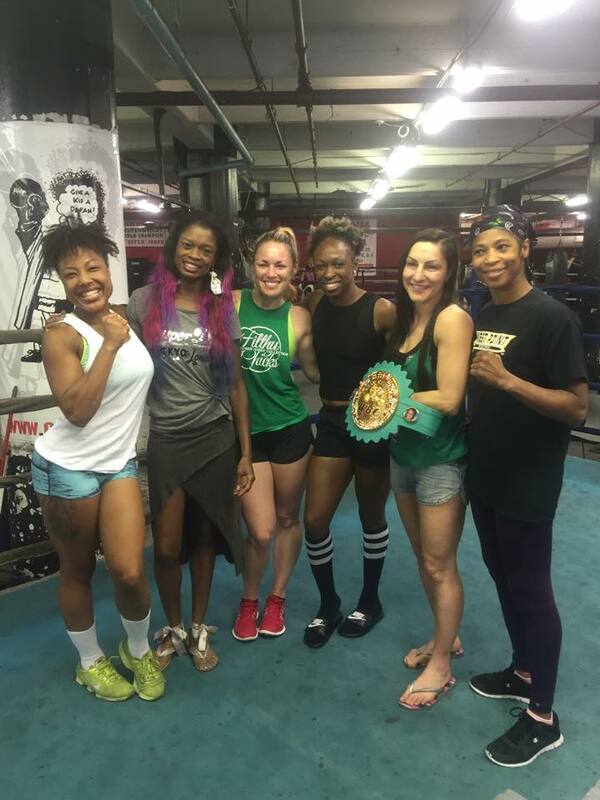 The Women in Olympic boxing is a great step in the progression of our sport. However, the corruption in that arena keeps the mainstream audience from embracing it, male or female. As for the pro arena, as long as the grossly mismatched Title fights continue, our sport will never be respected. 7. As you well know, the only way to watch female boxing in the United States is as a video stream, on certain local cable channels (very rarely live) and on YouTube. Meanwhile, fights are routinely broadcast from Argentina to Mexico and from Germany to Japan. What is it going to take to get the networks to “wake up” and start putting female fights back on television? The American public has not been exposed much to the great competitive fights as other countries have. Perhaps if there was a T.V. Show that showcased good female bouts like [Ana] Torres vs. [Jackie] Nava for example, the respect and interest would grow. 8. While you’ll likely keep boxing for some time to come – when you do finally “hang-up” the gloves, will you stay in the boxing world in some capacity? In other words, what is next for you? I like to keep my hopes and dreams close to my heart. In my Hawaiian culture we don’t speak of it out loud. I can say though, that my passion is always my path.